Peeling off Río Grande Boulevard to this Albuquerque park, city noise falls away as cottonwood forests drop their leafy curtain around this refuge. Comprising 270 acres of bosque habitat along the Río Grande, the park offers easy river access along flat, sandy trails. A draw for wildlife, some 300 bird species have been spotted here, not to mention aquatic fauna such as the frogs, snakes, and muskrats that reside in the center’s pond. View the wildlife from the Observation Room at the Vistors Center, or join the Friends of the Rio Grande Nature Center on one of their guided nature walks or twilight hikes. (505) 344-7240. In 1916, Mexican revolutionaries led by General Francisco “Pancho” Villa attacked a military camp a few miles across the border in Columbus, New Mexico, killing 18 Americans. Villa’s ground invasion marked the only one in the continental U.S. since 1812. Today, the State Park erected in this sparse landscape commemorates these events. Established on the former grounds of Camp Furlong, from which U.S. General John J. “Black Jack” Pershing launched his unsuccessful 11-month pursuit of Villa, the Park includes an exhibit hall with equipment similar to that used by Pershing. This includes a full-size replica Curtiss JN-3 “Jenny” airplane used by the First Aero Squadron. (575) 531-2711. With fewer visitors than blockbuser parks like Carlsbad Caverns, Aztec Ruins offers an intimate opportunity to explore an Ancestral Puebloan great house along a self-guided 700-yard walk. It is also home to a subterranean Great Kiva—now the oldest and largest reconstructed building of its kind. With the City of Aztec’s plans to create a walkway from downtown across the Animas River to the monument, the word is about to get out about this invaluable site. (505) 334-6174, ext. 230. Founded in 2008, this Las Cruces park is the latest to join New Mexico’s State Park system. Comprising 300 acres of southern bosque habitat along the Río Grande, the park is one of only two State Parks that doesn’t offer campsites (the other is the Rio Grande Nature Center). During the day, meander two self-guided nature trails that wend past two man-made lakes and through an area whose restoration involved clearing 30 acres of invasive salt cedar and planting 1,100 native cottonwoods and willows. As with any fledgling endeavor, plans are still taking shape: Stay tuned for day-camp programs for kids, star parties, cowboy culture programs, and geocaching workshops, all of which are taking shape for spring and summer. (575) 523-4398. Hearing the wind sweep across the barren landscape here, it is easy to imagine the voices of Ancestral Puebloan people whispering through the ages about mysteries yet untold about their civilization. From 850 to 1250 a.d., the settlement was a hub of ceremony and trade. The multi-storied buildings were then—and remain today—a spectacular architectural display based on astrological alignments, geometry, and an understanding of the landscape. Beginning at the Visitors Center, the Canyon Loop Drive travels past several exemplary structures, including the most popular, Pueblo Bonito. If you’re looking for far-flung adventure, take one of four backcountry hiking trails (ranging from three to seven miles) to remote great houses. (505) 786-7014. El Morro’s reliable waterhole made this monolith, near present-day Grants, a popular stopover for Ancestral Puebloans, Spanish conquistadors, and American pioneers. Each group of travelers made its mark here—literally. Travelers have carved more than 2,000 signatures, dates, and messages at this destination, also known as “Inscription Rock.” Trek to the top of the bluff on the Headland Trail and you’ll be rewarded with a moonscape of alabaster sandstone and views of the nearby Zuni Mountains and El Malpais National Park. 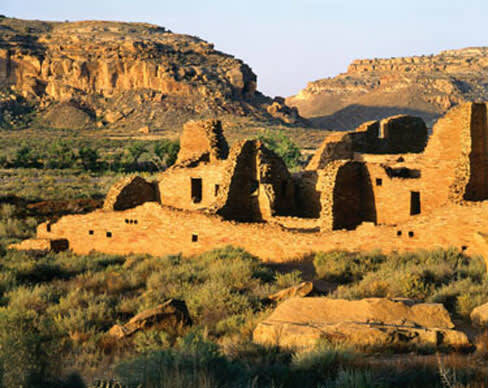 The Headland Trail also leads past Atsinna, an Ancestral Puebloan Ruin whose name means “place of writings on rock,” a testament to the Native peoples dwelling here from 1275 to 1350 a.d. (505) 783-4226, ext. 0. El Malpais National Monument and National Conservation Area, near Grants, encompasses more than 350,000 acres of land awaiting exploration. Once the major thoroughfare between Missouri and New Mexico, the Santa Fe Trail now exists as a string of historic sites, landmarks, and the occasional wagon-wheel rut. The National Park Service recommends 18 interpretive areas within New Mexico, from McNees Crossing, near Oklahoma, to Fort Marcy in Santa Fe. If you don’t have time to make that 275-mile trek, opt for the Santa Fe Trail Museum in Springer, which features pioneering, military, and Native American artifacts in the historic Colfax County Court House. (505) 988-6098. El Malpais (Spanish for “bad country”). Follow the cairn-marked route at Lava Falls, “wade” through ancient lava rivers at El Calderon, or hike the Continental Divide National Scenic Trail from the Visitors Center (but whatever you do, don’t go in the caves, which were recently closed to the public). (505) 783-4774. Part of the 33,116-acre Colin Neblett Wildlife Area near Eagle Nest, animals abound in Cimarrón Canyon, where crenelated granite formations form palisade cliffs that tower above evergreen forests. Anglers will enjoy eight miles of the rainbow- and brown-trout–filled Cimarrón River, and hunters can prey on elk, deer, bear, turkey, and grouse. Three campgrounds and numerous trails provide quiet settings to watch animals; come prepared with binoculars. (575) 377-6271. Tucked away in the northern mountains near Tierra Amarilla, these parks are connected by a 5.5-mile scenic trail along the Río Chama. Because Lake Heron is a “quiet lake” (boats must operate at no-wake speeds), the wildlife in and around the water is plentiful. You’ll likely see a variety of birds, including bald eagles, red-tailed hawks, water ouzels, and ospreys, in addition to trout and salmon. El Vado is closed December through March, so opt to visit this area during the warmer months, when you’ll be able to choose from more than 300 scenic campsites. (575) 588-7247. At this monument near Silver City, explore dwellings of the Mogollon people, who lived in the area over 700 years ago. Then pack into the Gila Wilderness—the nation’s first wilderness area, and an undisputed backcountry favorite. It’s the largest wilderness area in the Southwest, with more than 550,000 acres to explore (that’s not including the nearby Blue Range or Aldo Leopold wilderness areas, which are also parts of the Gila National Forest). Head for the hills to see how many of the 107 bird species, 387 plant species, and 37 mammal species you’ll encounter. Or soak in one of the many nautral hot springs here; the Lightfeather hot spring is only a 20-minute walk from the Gila Visitor Center. (575) 536-9461. With 35,000 acres of lake surface, there’s something for everyone at the state’s largest and most popular lake, located near Truth or Consequences: swimming, boating, waterskiing, fishing, canoeing, even scuba diving. Fishing is also popular, and several record-setting fish have been caught here. More than 200 miles of shoreline mean plenty of campsites, picnic areas, and RV hookups—not to mention hiking along sandy beaches and desert nature trails. The reservoir also contains four islands—one of which is an ancient volcano shaped like an elephant. (575) 744-5923.